With over half of all Google searches already coming from mobile devices it is really no surprise that consumption of mobile video is also increasing at a massive rate. In a report just released by communications giant Ericsson, the growth of video consumption on mobile devices has been predicted to rise by around 55% each year all the way through to 2021. At that rate, it will reach over 70% of all mobile traffic. The trend is accentuated by the growing use of autoplay video content in social media and web pages, which is considered video traffic in this context. YouTube still dominates video traffic in most mobile networks and accounts for between 50–70 percent of total video traffic regardless of terminal type. Interestingly (but no great surprise), Netflix has been able to reach 10-20 percent of total mobile video content consumed in markets where it has a presence. Total mobile data traffic almost doubled in 2015 in South East Asia and Oceania where social networking, video streaming, messaging and browsing continue to be among the region’s most popular smartphone apps. 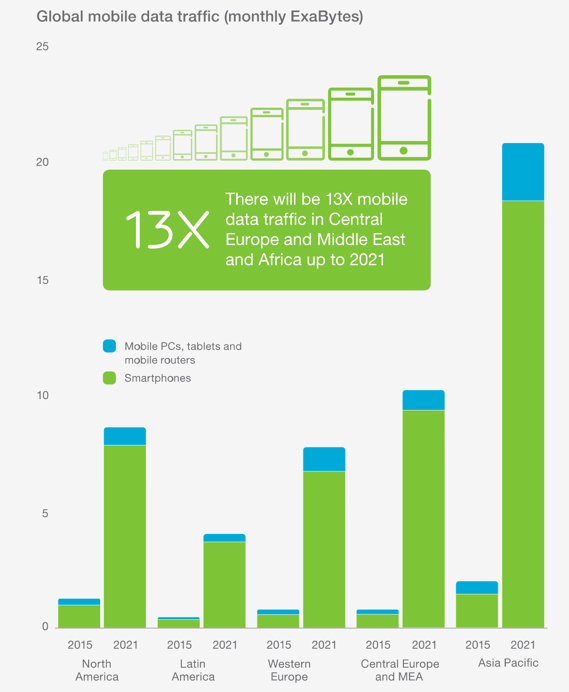 Asia Pacific will have the largest share of mobile data traffic in 2021, due to it being the most populous region with a rapid growth in subscriptions. China alone will add 210 million mobile subscriptions between the end of 2015 and 2021. Video content production (and the optimisation of it) will become more mainstream and necessary to get your message across to the next generation of mobile content consumers. Already we have seen a great New Zealand success story with the cloud-based video content creation platform 90 Seconds recently securing over $10 million in funding from Sequoia Capital (possibly the biggest name in the investment game in the US). Companies like 90 Seconds will enable mainstream SMB companies through to corporates to create engaging content quickly and at a reasonable rate compared to what has been possible previously. Finding a formula that works for your business and replicating it in good, engaging, useful video content will pay big dividends in years to come.